Some situations may require the purchaser under a trustee's deed to record a purchaser's affidavit along with the trustee's deed and trustee's affidavit. 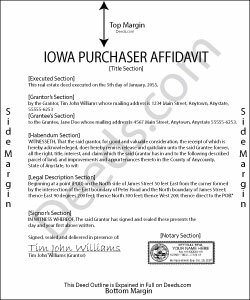 The purchaser's affidavit is executed by the grantee of a trustee's deed and acknowledges receipt of a trustee's affidavit under Iowa Code 614.14. Consult a lawyer with questions about trustee's deeds and affidavits. Christine P. said: I was hoping to find information of a property belonging to my grandparents. Your site says it can go back 10-20 years I will just have to go to the courthouse and research. But very good site if your looking for recent information. Thomas D. said: Can I use this for easement in gross ? Like to grant cousins easement to use river front property with riparian rights ? Reply from Staff: Sorry, we are unable to give advice on specific legal situations.